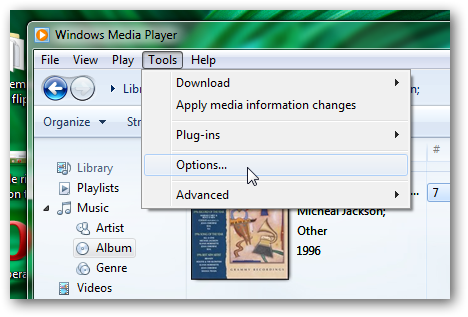 Windows Media Player (WMP) 12 in Windows 7 lets you preview and listen your songs or tracks automatically on mouse hover. The playing stops as soon you lift off the mouse cursor. Now, check the box (where we have placed the cursor in the above sceenshot) where the text beside it saying “Automatically preview songs on track title hover” under Media Library Settings. Click Apply and then OK. This Article Has Been Shared 8939 Times! Playing Media files and customizing Windows Media Player 12. 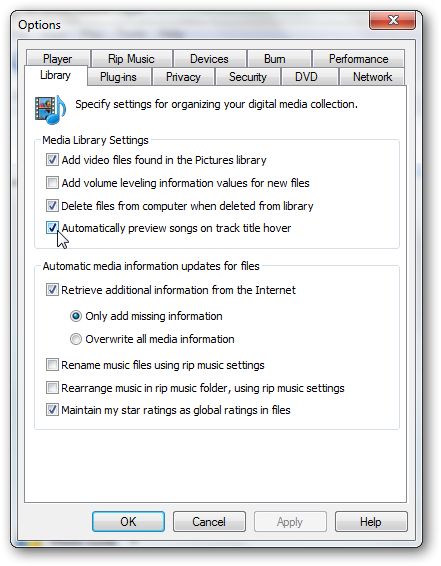 Enable and choose the seven backgrounds provided by Microsoft by default (but they are not easily discoverable) in Windows Media Player 12. Simple way of creating your own Windows Media Player Skin, without the need of knowing any complex xml and java script programming knowledge. Windows Media Player (WMP) can not play flash (.flv) files by default. However, by using a plugin called Play FLV, we can play .flv files on WMP in Windows 7. Cite this article as: Abhishek Ghosh, "Preview songs in WMP 12 on mouse hover in Windows 7," in The Customize Windows, March 5, 2011, April 21, 2019, https://thecustomizewindows.com/2011/03/preview-songs-in-wmp-12-on-mouse-hover-in-windows-7/.